I actually completed a full series for the first time in my blogging career. I was supposed to do it consecutively, but I just didn’t have it in me, but I completed it nonetheless. I took it upon myself to discuss each of the Boondocks cartoon characters and highlight various episodes that I felt best highlighted their character traits. I pitted some against the other given the script to show how I felt they truly were created to be. I refused, or at least tried my best to not fall into the trap of making each of the characters one-dimensional and viewing them as stereotypical characters. Case in point, I tried not to paint Riley and Huey as the yin and yang of black urban maleness, but rather attempted to go a bit deeper in the discussion. I did this because rarely is the surface truly who the person is. Generally what we manifest on the surface is a result of deeper issues and past experiences coming to a head. About the only person I intentionally portrayed one-dimensionally was Uncle Ruckus. I hope you enjoyed this series. Make sure to go back and leave comments as you see fit. Well, I haven’t watched every Boondocks episode, and I’m not a social psychologist. It would take a lot more to do all of that. I’d probably have to do some studies on how adult cartoons are received in this country, prolly get some interviews from Aaron McGruder et. al. and probably after all of that, I’d have a book to publish. just read all the case studies. great work. really on point. 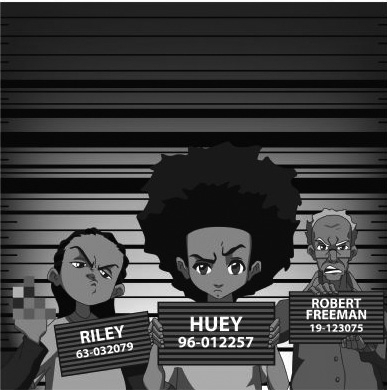 i think the boondocks is tops in terms of providing legit social commentary. is it me, or does it seem that cartoon shows are always the best at doing so? Most certainly, someone was saying I should write a book about it. And I was like, um, no, lol. But honestly, cartoon shows like The Simpsons, South Park, Family Guy and now we can add The Boondocks have done wonders to aptly parody and highlight many aspects of our culture even more so than sitcoms of the 1990s. As we progressed in the 2000s and now 2010s, programming generally doesn’t do what cartoon shows have been able to do. It’d definitely be interesting research. Especially because these cartoon shows last for so long. The Simpsons are entering their 21st season this fall and Family Guy, go figure has been around for a decade. It doesn’t even seem to be that long.